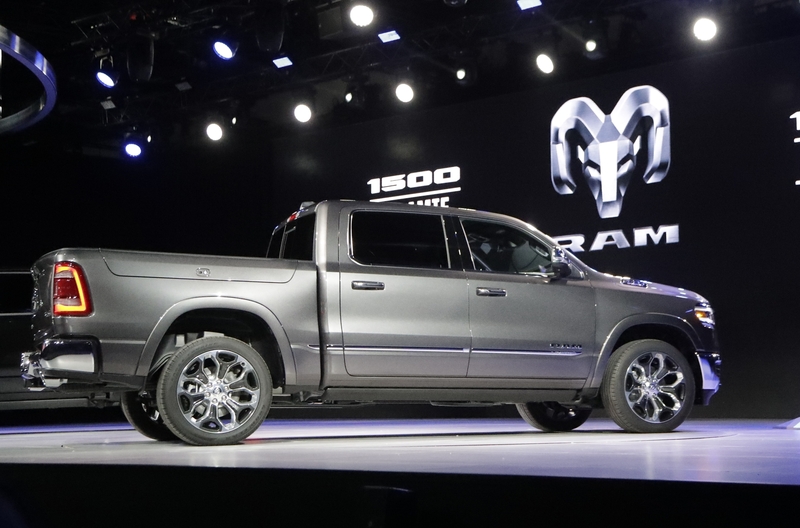 The 2019 Ram keeps the current look of a semi cab, but it grew by 4 inches and is slightly wider. The grille is larger, with a forward-leaning, aggressive slant and the hood is higher to look more like a big rig, as well as to help the truck glide through the wind. It’s 225 pounds lighter than the outgoing model to compete with lighter rivals, and the frame is almost entirely made of lighter, high-strength steel. The tailgate and other parts are made of aluminum. Even the chrome Ram logo at the rear got a more chiseled, brawny look. Fiat Chrysler says its interior room is the largest in its class. Power is the most significant change. The truck gets a mild hybrid system standard on most gasoline versions. It replaces the alternator with a motor and a 48-volt battery pack, which can shut down the truck at stop lights to save fuel and boost acceleration. The system reuses braking energy to charge the battery. Buyers get the choice of a 305 horsepower 3.6-liter V-6, a 395 horsepower 5.7-liter V8 or a 3-liter V-6 diesel with 240 horsepower. With two-wheel-drive and a mild hybrid V-8 engine, the truck gets 19 miles per gallon in combined city and highway driving. That’s two miles per gallon better than the 2018 version with a similarly sized engine. The new Ram went on sale earlier this year. A base Tradesman quad cab starts at $33,390 including shipping. The company is also selling the outgoing Ram 1500 model as the “Classic” for those looking for regular cabs or lower-priced models. 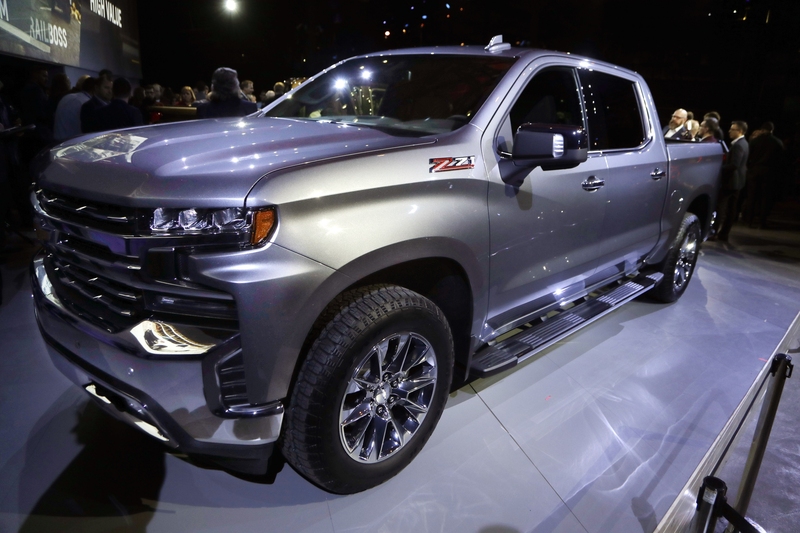 The nation’s second-best selling vehicle loses about 450 pounds as General Motors tries to meet government fuel economy requirements that will be in effect through at least 2020. Engineers took the weight out by melding different metals. All of the swinging parts, including the doors, hood and tailgate, are aluminum, but stationary parts such as the bed are still steel. The new truck is just under 2 inches longer than the old one for more cargo and interior space. The short bed in the crew cab, for example, is 1.7 inches longer than the outgoing truck. The frame is made of lighter “high-strength” steel, and there’s ample aluminum elsewhere. Buyers will get a choice of four engines and multiple transmissions, including a four-cylinder for the first time in recent history. The 2.7-liter turbocharged four isn’t a wimp. It puts out 310-horsepower, but its mileage wasn’t released. Also available are two V-8 engines — a 5.3-liter one with 355 horsepower and a 6.2-liter powerplant that puts out 420 horsepower. Both can shut off any number of cylinders for better gas mileage. And there’s a holdover 285-horsepower 4.3-liter V-6 on the base work truck. A two-wheel-drive model with the smaller V-8 gets 19 miles per gallon in combined city and highway driving, one mpg better than the comparable 2018 version. A six-cylinder diesel is coming later. Crew cabs starting at $36,095 (including shipping) for the short bed are arriving at dealers now with other models coming later in the year. The automaker’s small SUV is the new American family car, with over 400,000 sold last year. Now it’s new and improved, and that should boost sales further as the country keeps shifting out of sedans. The fifth-generation comes on all-new underpinnings that Toyota says will give it better handling and a smoother ride. It also has a wider, more athletic stance and sits a little lower. The distance between the wheels grows by 1.2 inches for more passenger and cargo space. 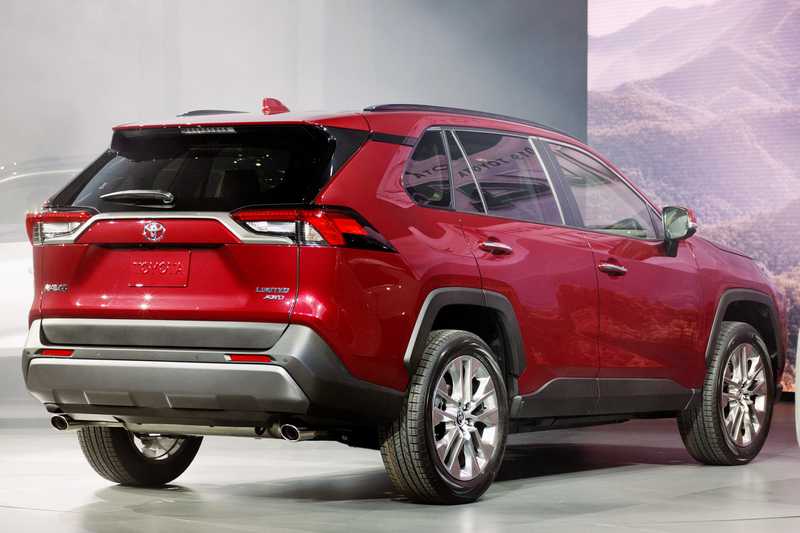 It comes standard with Toyota’s safety system, which includes automatic emergency braking. It’s powered by a 2.5-liter four-cylinder engine and an eight-speed transmission, or a 2.5-liter gas-electric hybrid system with a continuously variable transmission. The 2019 RAV4 goes on sale by the end of this year. Price and gas mileage will be announced later. 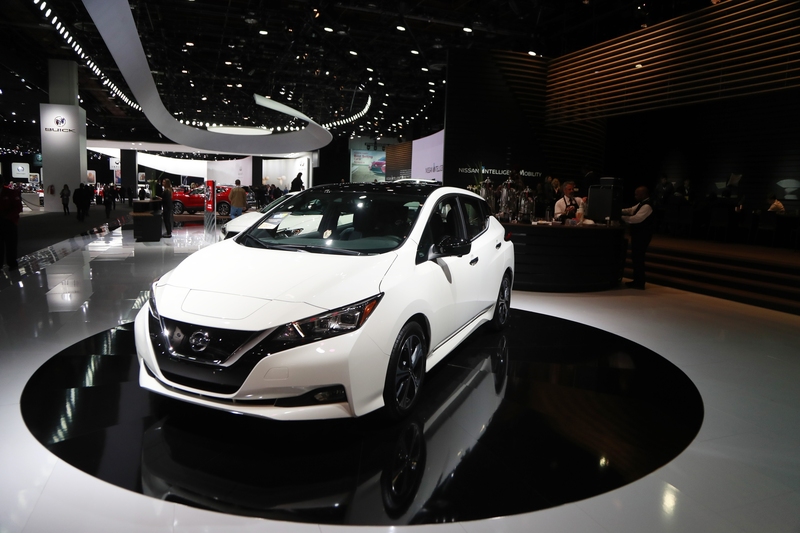 Nissan just restyled the Leaf electric car this year, but its 150-mile battery range was far below its main competitors, the Tesla Model S and Chevrolet Bolt, both of which can go over 200 miles on a single charge. But sometime before the 2019 model year ends next summer, Nissan will unveil a version with a bigger battery that can go over 200 miles, the range many industry experts consider the threshold to ease driver fears of running out of juice. Nissan isn’t saying exactly when it will reach showrooms, nor is it giving the price or a precise battery range. The current Leaf starts at $29,990 before a $7,500 federal tax credit, but the longer-range version almost certainly will cost more. There’s a little room for the price to grow and still be competitive. Tesla’s Model S starts at $35,000 but you can’t buy one yet for under $49,000. And Tesla’s tax credits will expire at the end of the year. The Bolt goes for $37,495 including shipping, without the tax credit. The latest addition to the British luxury sports car maker’s lineup means “super light,” in Italian. The coupe with a curvy body and panels made mostly of carbon fiber attached to an aluminum frame has a V-12 engine that puts out 715 horsepower. With its eight-speed automatic transmission, the replacement for Aston Martin’s Vanquish S can go from zero to 62 miles per hour in 3.4 seconds and reach a top speed of 211 mph, the company says. Yet the rear-wheel-drive car weighs only about 160 pounds more than a mainstream Toyota Camry with a V6 engine. The big engine was moved low and as far back as possible to reduce the center of gravity and optimize handling, the company says. Yet the gas mileage isn’t too bad: 22.9 miles per gallon in combined city and highway driving. The DBS Superleggera starts at just over $308,000 including shipping in the U.S., where deliveries start in the fourth quarter.